This Bowflex Max Trainer M5/M6 vs. M3 Comparison is updated and revised to correctly take into account the latest 2019 models from Bowflex. There are three offerings in the Bowflex Max Trainer series – the Max M3, the Max M5 (remodeled as the Max M6), and the Max M7 (remodeled as the Max M8). The M7/M8 is as good as it gets and comes in at well over $2,000 ($2,299 to be precise). The M3 and the M5/M6 are cheaper, coming in at $999 and $1,699, respectively. Please note, in November 2018 the M5 model was upgraded is now called M6. Both are excellent workout machines, and they have similar features at first glance. But they’re quite a bit different when you start digging. So, should you get the upgraded M5/M6? Or is the M3 enough for your needs? What’s the difference between Bowflex Max Trainer M3 and M5/M6? That’s what this page will help you to understand. Read through the core similarities and differences of each below (with explanations) and you’ll know exactly which one to choose by the end. Every Max Trainer machine uses the same type of movements to give you a flawless workout. When you work out, you work your entire body – not just individual muscles. A session on the Max Trainer is a full-body workout. You burn calories and lose fat at a faster rate than normal. Because of the optimized technology, you shed more weight with the same amount of effort. Both the M3 and the M5/M6 look fairly similar, too. Purchasing an exercise machine is usually risky because you don’t know if you’ll love it. If you don’t, you’re stuck with it. Bowflex (the company behind the Max Trainer series) realizes this. So, they offer a refund policy that is good for up to six weeks from when your M3 or M5/M6 arrives at your doorstep. Set it up at your leisure, and if you don’t love it, send it back for free. Easy. The first obvious point is that the M3 is about $600 cheaper than the M5/M6. But, the M5 has free shipping, whereas you only get $50 off shipping with the M3. So, the M5 is only about $500 more expensive than the M3 in actuality, and it comes with more options, too. Many preset workout programs – The M3 has only one programmed workout besides the Manual option, whereas the M5/M6 has over 10. You do your own thing with the M3 – the M5/M6 can do the thinking for you. Heart rate monitors – You gain greater insight over your workout with the M5/M6, whereas you’re left guessing on some aspects with the M3. Speaker and bluetooth connectivity – the M3 is a basic model, but the M5/M6 takes the tech a step further with bluetooth integration and a fairly nice speaker system that’s easily heard over the whirr of the machine when it’s running. Ultimately, there is no firm criteria for who should pick either one. But depending on who you are, the choice should be fairly easy to make. Pick the M3 if… this is your first Bowflex machine and / or you exercise in a casual manner. For most people, the M3’s basic features will be more than enough, and you will still get the Max Trainer technologies, which is the most important part. It’s not like you’re compromising on construction or quality of materials if you pick the M3. Pick the M5/M6 if… you exercise with more intensity or you want all of the bells and whistles that an exercise machine can have. If you get the M5/M6, you’re getting something that professionals use, whereas mostly casual users choose the M3. It’s not absolutely necessary to upgrade to the M5/M6, but if you’re making an investment into a workout machine, it’s sometimes smarter to go for the better version, even if it’s a little bit more money out of pocket – after all, you will be using whichever one you pick for years. With the M5/M6, you’ll get better workouts through the preset programs, and the speakers and heart rate monitor are both very handy additions. The warranty also lasts for a full year longer if you buy the M5/M6, which is nice if you’re someone who likes to have peace-of-mind. Still on the fence? Check out our individual reviews for the M3 and the M5/M6. Regardless of which machine you choose, you will want to purchase off the official Bowflex site. You will receive discounted shipping on the M5/M6 and $50 off shipping for the M3 if you do. You will not receive these discounts if you purchase at another online retailer or a physical store. We wish you the best of luck with your Max Trainer purchasing decision, and remember this – if you are looking at the Max Trainer series in the first place, you are already a step ahead. Regardless of which one you pick, you will be getting a full-body workout and burning more calories than usual, which is fantastic news for anyone looking to lose weight and slim down in a serious way. 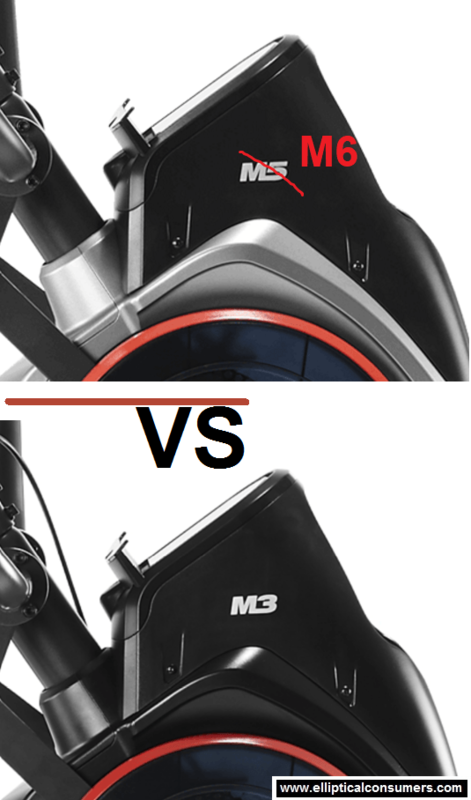 If you found this Bowflex Max Trainer M5/M6 vs. M3 Comparison enlightening, you may also want to check out my full M3 review, my full M5 review (discontinued), or my full M6 review (new).